As of recent, I’ve been developing a huge amount of admiration for the late Andy Kaufman. A concept-driven performance-artist, Kaufman was brilliant and awkward, an individual highly capable of constructing a scene and directing an audience in any given direction. With typical reactions to his work varying between alternating levels of love, confusion, and abhorrence, Kaufman sincerely strived to redefine the relationship between performer and audience, challenging the expectations of exactly how an “entertainer” is supposed to fulfill their role. His world was a palimpsest, his “acts” and “put-ons” so utterly convincing and complete that they merged with the everyday, his performances and his life becoming at times indistinguishable from one another. From eating a bowl of ice cream as part of a stand-up routine to taking a sold-out crowd at Carnegie Hall out for milk and cookies, Kaufman’s repertoire was rooted in an understanding and appreciation of the quotidian, elevating, celebrating even, the everyday. Thankfully, there is a lot of footage to be watched via YouTube to allow for a better understanding of the breadth of Kaufman’s work. Well I strongly recommend viewing these gems of the internet on your own, prolonging multiple mornings with esoterica, Elvis impersonations, and children’s television for adults, I wanted to feature a few of my favorite clips. This performance is totally, totally amazing. 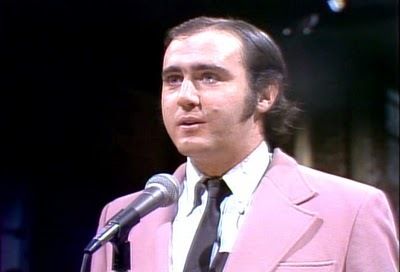 Not that this particular clip showcases it, but Andy Kaufman was actually quite the vocalist. All of his Elvis impersonations were sung rather than lip-synced. As Kaufman was always reluctant to call himself a comedian, I believe he would have much preferred the title of “song and dance man”. I suppose one of the elements of this routine that is so funny is how utterly awful “I Trusted You” is as a song and the fact that he was allowed to perform this sort of act in front of a live audience on national television. My favorite part is when Andy returns for his encore and moves into the audience, aggressively pointing at individual members in the front row, adamantly repeating the songs only line. As Kaufman’s reputation as a performer earned him more and more fame, he seemed rather infatuated with ideas involving banishment and failure. Always testing the limits of the entertainment industry, Kaufman exploited his notoriety in order to conduct experiments in performance he may have otherwise been unable to do. Additionally, as an entertainer and an artist, Kaufman had a serious interest in creating a commentary on the business he was inevitably apart of. One of the characters primarily responsible for Kaufman’s rise to mainstream attention, Latka, originally served as a means for Kaufman to intentionally bomb. The “comedian” would painfully present a series of awkwardly-paced, thickly accented puns, unbeknowest to the audience that this foreign man was in fact part of an act by a young performer from Long Island, New York who was about to transform his rueful character into a dead-on Elvis Presley impersonator. After audiences were initiated and better understood the inner-workings of Kaufman’s routine, Tony Clifton was created, a role he shared along with his best friend and co-writer, Bob Zemuda [one of Zemuda’s finest stunts as Clifton can be seen here]. Along with creating this abrasive identity to employ, Kaufman undertook additional ventures which were essentially exercises in failure, such as inviting his entire family to perform along with him on Thanksgiving in front of six-hundred people at Kutscher’s Hotel, a performance so upsetting to the resort’s management that Kaufman, along with his entire family, were immediately evicted from the hotel after the show. The above clip serves as an excellent example of one of Andy Kaufman’s excursion into the awkward and uncomfortable, the laughter noticeably subsiding during the routine and the reality of the performance being brought into question. In an act such as this, we can see that “Andy Kaufman the Celebrity” essentially served as another character for the performer to use. But so as to not end on a morose note, click here. This entry was posted in Uncategorized and tagged Andy Kaufman, comedy, conceptual art, performance art, television. Bookmark the permalink.